We’re officially a week into the epic Oracle v. Google trial, as Oracle attempts to squeeze Google’s mobile operating system to see if there’s money inside. For those of you who haven’t kept up on every last detail, the trial has been broken into three phases; the first part covers the alleged copyright infringement and is what is happening right now. This will be followed by a second phase covering Oracle's greatly diminished patent infringement allegations, and finally (if Oracle wins either of the first two phases) a damages phase will be triggered. Oracle officially rested its copyright case earlier today, so now is as good of a time as any to look around and take stock of where things stand. Aside from the prognostications of doom and gloom for Android by Oracle-sponsored FOSS Patents, trial observers and legal experts seem united in feeling that Oracle has run into significant headwinds with both the judge and the jury over the last week. In a discussion without the jury present late on Saturday, Judge Alsup dropped a bombshell when he decided that he would personally rule on the issue of whether or not APIs can be protected by copyright, rather than leaving that distinction up to the jury. He also expressed concern that Oracle was over-reaching with their attempt to copyright Java APIs, which doesn’t bode well for Oracle. We imagine that Oracle would have liked a chance to convince a jury of non-specialists that copyright should be extended to the basic call specifications of an open-source programming language, but ultimately Alsup decided it’s the job of judges to interpret what the law covers, while juries are supposed to decide if the law (as properly defined) was broken. Judge Alsup will not actually rule on the issue until the conclusion of the trial, so as not to prejudice other arguments made by either side. It’s always harder to read a jury’s reaction, but court room observers reporting to Groklaw and The Verge have been consistent in their view that Oracles lawyers have really struggled to connect with the jury so far, having attempted to do far more than their time allotment allowed, and largely failing to get anything useful out of Google employees they brought to the witness stand. Even Oracle’s own expert witnesses ran into trouble; computer scientist John Mitchel was apparently unaware that a report he based his conclusions of copying on was actually examining Apache Harmony files, not Android code that shipped on a phone. The only code that actually shipped on a handset turns out to have been written by a Google employee (then working for Sun) who personally donated the code to the Java Community Process. This morning Oracle wrapped up with testimony from Andy Rubin, the father of Android, and Eric Schmidt, who was CEO of Google (and previous Sun employee). Live blogs show nothing positive appears to have been gained by Oracle from their testimony, and at one point Oracle’s lead attorney lost his cool and got into a heated argument because one of the emails they wanted to enter into evidence could not be verified. In short, Oracle needed to hit it out of the ballpark to win on their copyright claims, and it doesn’t appear that they did so. We can’t know what the jury is thinking of course, and it’s also possible that Oracle could score some major points while cross-examining Google’s witnesses, but for now it seems that Android will live to fight another day. Of course even if Oracle fails to score at the copyright portion of the trial, they will get another chance at the plate in the patent portion that follows. But in this game they only have to whiff twice to strike out – and right now all indications are that the first phase isn’t going the way Oracle would have liked. 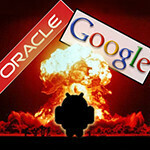 Doubtful that Oracle will be hurting from what this lawsuit costs. It is not even rounding error on Oracle's net income. Just waiting for the final verdict. Geez, bring out moto patents google, that'll show oracle... lol Seriously java is open source right? So why are they even suing for open source? ?